Bob-omb Battlefield is the first course in Super Mario 64 and Super Mario 64 DS. The player character can enter the course through the painting in the far-left room on the first floor of Princess Peach's Castle and the door into the room does not require any Power Stars to open. Bob-omb Battlefield is the battleground of a war being raged between the black-colored Bob-ombs, lead by the Big Bob-omb, and the pink-colored Bob-omb Buddies. 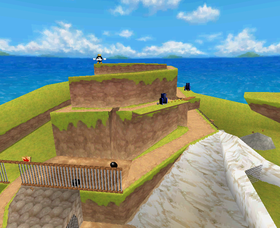 The setting of the course takes place on and around a mountain, split between the territories of the two Bob-omb races. 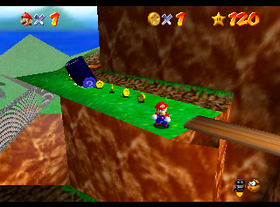 The player starts in the Bob-omb Buddies' territory, far off from the mountain in an area with two Bob-omb Buddies and a cannon that will be available to use after the player has collected the first Star, along with a couple of crates and Goombas further ahead. To the left of the starting area are a few Bob-ombs and a gate that has to be opened by pressing the Purple Switch on the other side of it, providing a shortcut should it be opened. Additionally, several large boulders will roll down the slope and collide around this area. Going up the bridge from the starting area will lead the player into a field with several large rocks, Goombas, a Koopa Troopa, and the only Chain Chomp in the games. Several Water Bombs will fall into this area, damaging the player character if they come into contact with them. Crossing the teetering bridge ahead will bring the player into the Big Bob-omb's territory. To the left of the bridge is an area with a couple of Goombas and several log stumps, in the middle of which is the Star Marker for this course. Up the short set of stairs is a large field with many Bob-ombs and a cannon, along with Water Bombs falling from the sky to attack the player. At the end of the field is a path leading behind the gate from earlier. Going up the stone path will lead into the base of the mountain, which has two or three large boulders (depending on the Star chosen) rolling around in the crevice. The way up the mountain is a spiraling pathway with large boulders constantly rolling down it and gaps the player has to jump over. The player can also use a warp point, located in the small cave the boulders roll out of, to warp up to the top of the mountain. 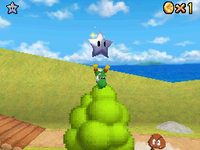 At the top of the mountain either lies Big Bob-omb during the first Star, the goal during the race against Koopa the Quick during the second Star, or nothing at all during any other Star. Also on the course is a floating island that does not appear to be controlled by either territory. The island contains a red and a yellow ! Block, containing a Wing Cap/Wing Feather and a Power Star respectively, and a cannon that can be used to collect the rings of Coins floating in the air. Super Mario 64 DS This mission involves fighting Big Bob-omb at the top of the mountain. 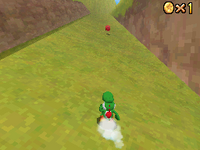 Super Mario 64 DS The mission's objective involves racing against Koopa the Quick to the top of the mountain. Super Mario 64 This mission's goal is to collect the Power Star located on top of a floating island. 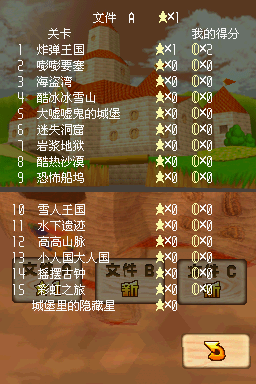 Super Mario 64 DS This mission involves collecting five Silver Stars located around the Battlefield. Super Mario 64 DS This mission involves fighting Big Bob-omb again in a rematch. Super Mario 64 DS This mission involves collecting eight Red Coins scattered across the Battlefield. Super Mario 64 DS The goal of this mission is to fly through rings of Coins in the sky. Super Mario 64 DS This mission's objective is to collect the Power Star guarded by the Chain Chomp. Spinning Heart: Near the top of the mountain. Homing Mushroom : #1 In a tree by the Koopa Troopa. Static Mushrooms : #2 In the tunnel under the mountain gate. Triggered Mushroom : #3 Appears after collecting some coins from the ring around the flower bush. Mario can warp from a bush of flowers near the Goombas and the cannon to another bush which is near the Star Marker. Mario can warp from the alcove midway up the mountain where rolling balls are coming out to the other alcove near the top of the mountain. In the Super Mario Mash-Up Pack in Minecraft, one of the paintings that can be hung on the wall is the painting to Bob-omb Battlefield. In Super Mario Odyssey, the brochure held by Hint Toad and in the Odyssey depicts Bob-omb Battlefield. In a poll created by Nintendo of Australia and New Zealand, Bob-omb Battlefield was voted the "#1 Best-Ever Sandbox-Style 3D Mario Stage". Whomp's Fortress came in second place, Pinna Park in third, Cool, Cool Mountain in fourth, and Bianco Hills in fifth.